God can do whatever He wants because He is God. And no matter what He does you must view Him as and worship Him as good. God is angry and violent. Hell will be filled with more people than heaven. God demanded a human sacrifice in order to be pleased with humans again. God is glorified by tormenting people. And for some unfathomable reason He will torture the majority of His image bearers ( if you stick with a “traditional” view of hell). God is more concerned about abortion and condemning LGBT individuals than just about anything else happening in His world today. All it takes to be “saved” is to say a prayer. God cares about the lives He created until He doesn’t. Don’t think too hard about it. Just be happy you (presumably) made it safely into His eternal life boat. People are just a means to an end. Only God matters. His creation has no right to question or complain. God isn’t interested in (or able to) reconcile and save all or even most of the people He created. God created woman to serve man. Submission and serving is pretty much a one way street. Though the opportunity to “serve” via leadership positions is mysteriously something women were just not considered worthy to do. The “Good News” is really only good for a small portion of the world’s population. This is the short list of some of the toxic ideas I’m realizing and naming regarding my understanding of God. Writing some of these things down is a way I’ve found to be helpful in working out these unhelpful and sometimes blasphemous ideas. Some of these messages were obviously not presented so blatantly but still what I reasoned out from many things I learned in church, college, Bible studies, ect. And as the title says I’m learning to let go of these ideas. “I realized that I was tired of being comfortable with sickness and death and inequality; so, too, was I tired of being overwhelmed with all of the places where it seemed that God was absent. I was tired of trying to fix all the problems on my own, of placing the burdens of the world on my own shoulders. I had reached a breaking point, where I no longer believed I could save anybody and I didn’t know if God could either. I, unlike the majority of people at the service, was afraid to give up my false sense of control. I was afraid of looking foolish, of deciding to truly believe that a very good God was at work in the world. I was nervous to live in a world that seemed inhabited by so few, to refuse to assimilate into a life either of despair or of religious platitudes. Here are some things that made me think this past week. Inclusion does not equal a full endorsement of everything in each post or at the sites they are linked to. Some parts are in bold because they stood out to me as particularly good points. To read each blog in its entirety click on the link beneath each excerpt. After Charlottesville, a friend asks if I believe everyone who marched to protect Confederate statues is racist. I think of my date and his tattoo and his indignation and my coffee. Had he been racist? Do I care? My friend wonders if maybe it’s possible to bring some of those people to our side if they don’t feel so attacked. I tell him I can’t bring myself to care about their feelings, and he is surprised by my reaction. He’s an old friend. I used to be cooler when he knew me well. I believe in grace for people who are imperfect allies and generosity for those interested in learning but haven’t yet. But I no longer believe the comfort of white men is more precious than my own. They brought weapons. They clearly don’t mind if we feel attacked. It’s not that I think allegiance to a Confederate flag or monument automatically makes someone racist. It’s that I don’t care whether they are or not. It’s a dealbreaker for me. Maybe that makes me cavalier — or cool. Maybe my friend is right, and some of them could be brought to our side if people like me invested energy in making them feel less judged and more welcome. But since I don’t, they stay on their side. Maybe we who claim faith should refrain from pretending we understand how this world works when it comes to faith and pain and suffering. Maybe we should admit the mystery, discomfort, and the tension that spirituality yields in painful, terrifying times. Maybe when people are being terrorized by nature or by the inhumanity around them, instead of shouting sermons at them—we should shut up and simply try to be a loving, compassionate presence. Maybe we should stop trying to make God into something as petty, hateful, judgmental, and cruel as we are. If the God you’re following and preaching to people in their times of pain is an a-hole—it’s probably not God at all. I’m not saying we should promote lawlessness and allow people to rob and murder as they wish with no repercussions. And yes, I recognize there is an inherent moral quality in declaring some things legal and illegal based on their impact on society, even if all people may not agree on where that moral standard comes from. But we need to evaluate whether laws are God’s primary method of producing morality and change in people. They are not. Christians don’t have the right to live completely separated from people who don’t share the beliefs and practices of their faith. The Constitution affords rights to all citizens of our nation of free speech, freedom of the press, freedom to practice their respective faiths or not practice any faith at all. These rights don’t only apply to Christians. By the way some Christians react to people doing and saying things that are different than their Christian beliefs, you wouldn’t know it though. People have a right to live in ways you disagree with. That right, greater than being afforded by American law even, is afforded by God because He gives all humans free will and calls them to follow Him by choice, not force. No, He doesn’t agree with sin or rebellion against Him. Yes, there are eternal consequences for unrepentant sin against God. Yes, God wants every person to repent of their sin and be saved. Every person, however, has to respond to His call by their own choice (Acts 17:30-31). Further, nowhere in the Bible does it say that Christians should hide in a bubble and avoid everyone who isn’t like them. It says the opposite, actually (Matthew 5:14-16, 1 Corinthians 5:9-13). If Jesus interacted with people who didn’t yet believe in Him and follow His commands, then we as Christians should interact with people who don’t yet share the beliefs and practices our faith—and not just to convert them. There were some other thoughts I forgot in my first post regarding hell so I figured I’d just write a part 2. Again I’m arguing against the eternal conscious torment understanding that I was taught growing up. One really big problem with hell is that for all the talk of a happily ever after for the ones God saves (no tears, no more death, ect. as understood in Revelation) hell throws a few monkey wrenches into that scenario. If hell is eternal then sin, evil, pain, and suffering will exist alongside of us for eternity regardless of whether we see it or not. How is this a victory for God? Sure some might say it displays His wrath and anger against sin but it will also stand as an eternal testament to God’s failure to love, redeem and restore the majority of His image bearers. 1 John tells us that perfect love casts out fear. How many times does are we told not to fear in the Bible? Yet hell keeps most Christians I know in constant fear and anxiety wondering about their loved ones. And if they manage to somehow make peace with God torturing the majority of humanity that seems pretty problematic since Christians are supposed to love everyone (no exceptions). Yet even if we do love those around us now apparently those feelings of love and concern will evaporate upon death and we will spend eternity indifferent to those who have missed the boat and are suffering endlessly for it. In my first post I listed some books I’ve read on this subject but I didn’t really spend time showing Scriptural support. Below is a chart showing three of the main possible understandings of hell with Bible verses that could support each theory. 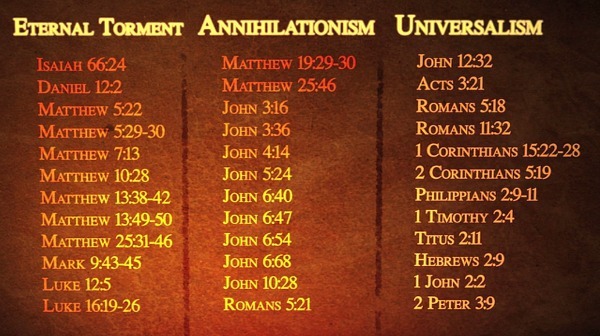 Frankly I find the Annihilation column to be a bit weak here but have read books and other peoples writings that build a much better case from the Bible some of which are referenced beneath the chart. As an addendum here is a link to a blog post by Benjamin Corey further illustrating Scriptural support for the annihilation position titled 25 Bible verses that disprove eternal conscious hell. At this point though I don’t consider myself a universalist I am sympathetic to the view and would not be at all disappointed to discover that God chose to love and save most if not all of humankind. For anyone who doesn’t like the idea of everyone being saved I genuinely have to wonder what that person’s understanding of love is. And I am not one to think sin is something to be taken lightly. I hate the evil I’ve seen on this planet in my short life. But I want to see and believe that healing, redemption and restoration will be accomplished more fully than any of us could begin to realize. And I think only God can make this happen. There is a reason God presents Himself as a Father throughout the Bible. And for anyone who thinks some sins are simply unforgivable or that He really puts a timeframe on how long He will wait for repentance I would like to ask a couple questions. If you are a parent (just imagine even if you aren’t) what would your child have to do in order for you to start torturing him/her as punishment for whatever it was they did to you? Would you/have you put time limits on how long you will wait for a loved one to reconcile themselves to you? Another problem I have with hell is that if it is in fact part of the reality that God has created then the Gospel (good news) isn’t really that great or unique. Every religion that offers relief from an angry, vengeful god can claim it has good news to offer you. How is Christianity different? Ultimately I can no longer square this “traditional” view of hell with a God who is supposed to be above all other gods in his offering of love, kindness and hope to humanity. Here are some articles and blog posts that made me think and taught me something new. Inclusion does not equal a full endorsement of everything at each link. Some parts I put in bold because they stood out to me. To read the entire article click on the link beneath each excerpt. ( The last quote and article is long but insightful for anyone interested in spotting predatory behavior and helps answer why abusers can often be found in places like church). “If your doubts become so overwhelming that you wonder if you are losing your faith altogether, then you are in good company. 1) It’s dangerous. Sure, some parts are very dangerous but so much of the Middle East is much less dangerous than even the US. If fact, a recent report ranked Jordan as less dangerous than the US – Global Peace Index 2017 So lets be careful not to discount the entire region as untravelable, when there are so many beautiful and safe places to visit in Jordan, Lebanon, Palestine and more! 1. As noted earlier, within organizations, predators have access to a ready/available pool of potential victims. Within a religious order, those potential victims are identified for the predator, who knows how often they will get together and where (Sunday worship service at 11:00 am, at the local chapel, for example). Metronomic frequency of meetings creates opportunities for the predator to exploit directly, or even at a distance, such as committing burglaries based on knowing precisely when no one is home. 13. Predators know or soon learn that society tends to revere and not question religious authority. People of high status such as famous coaches, TV personalities, politicians, and so on are often given great latitude to the point where allegations of misconduct, even serious criminal offenses are often ignored (Jimmy Savile in the UK; O.J. Simpson in the US).